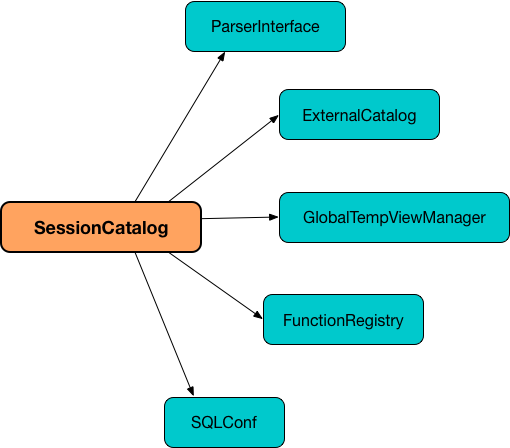 SessionCatalog is the catalog (registry) of relational entities, i.e. databases, tables, views, partitions, and functions (in a SparkSession). SessionCatalog uses the ExternalCatalog for the metadata of permanent entities (i.e. tables). SessionCatalog is a layer over ExternalCatalog in a SparkSession which allows for different metastores (i.e. in-memory or hive) to be used. SessionCatalog is available through SessionState (of a SparkSession). SessionCatalog is created when BaseSessionStateBuilder is requested for the SessionCatalog (when SessionState is requested for it). Amongst the notable usages of SessionCatalog is to create an Analyzer or a SparkOptimizer. A cache of fully-qualified table names to table relation plans (i.e. LogicalPlan). alterTable is used when AlterTableSetPropertiesCommand, AlterTableUnsetPropertiesCommand, AlterTableChangeColumnCommand, AlterTableSerDePropertiesCommand, AlterTableRecoverPartitionsCommand, AlterTableSetLocationCommand, AlterViewAsCommand (for permanent views) logical commands are executed. alterTableStats requests ExternalCatalog to alter the statistics of the table (per identifier) followed by invalidating the table relation cache. alterTableStats reports a NoSuchDatabaseException if the database does not exist. alterTableStats reports a NoSuchTableException if the table does not exist. alterTempViewDefinition alters the temporary view by updating an in-memory temporary table (when a database is not specified and the table has already been registered) or a global temporary table (when a database is specified and it is for global temporary tables). "Temporary table" and "temporary view" are synonyms. alterTempViewDefinition returns true when an update could be executed and finished successfully. alterTempViewDefinition is used exclusively when AlterViewAsCommand logical command is executed. createGlobalTempView simply requests the GlobalTempViewManager to create a global temporary view. SessionCatalog initializes the internal registries and counters. lookupFunction finds a function by name. For a function with no database defined that exists in FunctionRegistry, lookupFunction requests FunctionRegistry to find the function (by its unqualified name, i.e. with no database). If the name function has the database defined or does not exist in FunctionRegistry, lookupFunction uses the fully-qualified function name to check if the function exists in FunctionRegistry (by its fully-qualified name, i.e. with a database). For other cases, lookupFunction requests ExternalCatalog to find the function and loads its resources. It then creates a corresponding temporary function and looks up the function again. lookupRelation finds the name table in the catalogs (i.e. GlobalTempViewManager, ExternalCatalog or registry of temporary views) and gives a SubqueryAlias per table type. lookupRelation considers default to be the name of the database if the name table does not specify the database explicitly. getTableMetadata simply requests external catalog (metastore) for the table metadata. Before requesting the external metastore, getTableMetadata makes sure that the database and table (of the input TableIdentifier) both exist. If either does not exist, getTableMetadata reports a NoSuchDatabaseException or NoSuchTableException, respectively. Internally, getTempViewOrPermanentTableMetadata branches off per database. When a database name is not specified, getTempViewOrPermanentTableMetadata finds a local temporary view and creates a CatalogTable (with VIEW table type and an undefined storage) or retrieves the table metadata from an external catalog. With the database name of the GlobalTempViewManager, getTempViewOrPermanentTableMetadata requests GlobalTempViewManager for the global view definition and creates a CatalogTable (with the name of GlobalTempViewManager in table identifier, VIEW table type and an undefined storage) or reports a NoSuchTableException. With the database name not of GlobalTempViewManager, getTempViewOrPermanentTableMetadata simply retrieves the table metadata from an external catalog. requireDbExists reports a NoSuchDatabaseException if the specified database does not exist. Otherwise, requireDbExists does nothing. reset is used exclusively in the Spark SQL internal tests. dropGlobalTempView simply requests the GlobalTempViewManager to remove the name global temporary view.